Hey, you want to play with #VRDCEX? Hi everyone, happy February! This February 27 we will have a most fabulous Pittsburgh UserCon, where a lot of friends from the #vCommunity will come and we will have a jolly time geeking out on all things VMware. I could go on and on about who’s coming and what the VMUG leaders have prepared, but that will be another post ;) This post is to let you know that tomorrow, February 13, I will be playing with aDell Mixed VR headset, getting it ready so that we can have UserCon attendees play with #VRDCEX at the UserCon. Hi everyone, happy holidays :) This is a blog post to highlight a new entry in the super cool, so awesome you should read more of it, vBrownbag blog: Meet the expert interviews at @wpvmug and @cincivmug 2017Q4. I really enjoy filming these. There’s so many awesome people in the #vCommunity that I admire and I’ve met through twitter/VMUG/VMworld/Slack, but almost always don’t have the time and one-to-one focus to really get to know them. Hi everyone! This is a quick blog post to highlight a new entry in my Learning-in-IT.blogspot.com blog: Installing Fedora 27 on a UEFI-enabled Windows 10 machine with Secure Boot enabled. I hope you find it useful if you are in the same situation. I really think learning Linux/BSD is key to my future in IT, so I’m renewing my efforts to use it as my main OS and for studying for the LFCS exam. Hi everyone! 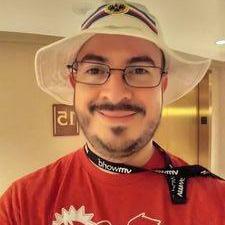 This is a retrospective blog post on the little open source project that Edgar Sanchez @edmsanchez13 and I launched in VMworld US 2017 named #vDocumentation We submitted it as a session in VMworld 2017 and we were very happy to see that 1) it was approved 2) it was a popular session! It was pretty neat that we got a 500 person room on Monday after the keynote, because people are very anxious to go into sessions at that point of the conference. Hello everyone, I was chatting with my good friend Nick Scuola @nscuola. He’s going to submit some talks for ZertoCon and mentioned he should read advice for writing abstracts. I offered him my experience, and it suddenly hit me that I should make a blog post about it, so it can help others. I went through one denial and one approval, for what in my mind were very similar talks, but I changed the abstract quite a lot. Hey! It’s your noob friend Ariel sharing what little he’s learned - exactly the one-eyes leading the blind :) Carl Capozza has done an excellent job of helping me get accustomed to using Git comands. I actually taught someone in the #PGHLittleHack 1.3 what I learned today and they were able to get it to work, and they were happy! So here I am sharing the blog post I did. Please let me know if anything isn’t clear. LittleHack003 - If you build it they will come! Hello again! Just doing a small post here to highlight I contributed a post for the Western PA VMUG Blog. After all, I did commit to #Blogtober, and I did tell you I would centralize my blogging activity in one place so Azarya can find it. The post is the final speaker details for the upcoming Pittsburgh VMUG this October 20. I’m not a leader anymore like I was in NYC, since I’m a VMware employee now; but one thing we should always understand is anybody can help without the title. Hello again! Let’s talk about blogging - in particular, say, I don’t know, my blogging :) Blogging is cool. It’s also not that hard. You don’t have to write a long essay - it shouldn’t be tweet-sized either, but it doesn’t need to be too long. Take a little while to share something, even if it’s just a piece of your mind. I particularly like focused blogs that solve some kind of problem most.